Can tourism boost Lao’s economy? Last July, Lao witnessed a catastrophe when the Xe-Pian Xe Namnoy dam located on the Xe Kong River in the Bolaven plateau collapsed following heavy monsoon rains. More than 6,000 people were made homeless, hundreds went missing and reports say the official death toll has so far risen to 35. The disaster is a sharp dagger in the side of the Lao government which hopes hydropower will be able to lift the country out of poverty by 2025. The dam collapse has also fuelled debates on the government’s ambitious “Battery of Asia” strategy. At a public panel discussion last month at the Christian Student Centre in Bangkok, environmentalists and experts argued that the strategy was doing more harm than good. Arguments centred around issues related to Lao’s hydropower investment projects, the current electricity generation situation in the region and the issue of accuracy in power-demand predictions. Niwat Roykaew, a prominent environmentalist from Chiang Rai’s Chaing Khong district, said claims from hydropower dam developers that the local people and the country would get many benefits from building dams have been contradicted by evidence from the sites of the facilities operating in Lao. “The dam developers always say that their project will provide free renewable energy from water, while the dam’s reservoirs would support local agriculture and aquaculture and be the water management tool for prevention of flood and drought,” Niwat said. “These are all myths, as even after many were dams were built on the upstream of the Mekong River, there were still floods in the downstream areas. Moreover, they have never admitted that the generation of electricity from hydropower dams actually has many hidden environmental and social costs”. Lao has a rich cultural heritage stemming from its many ethnic minorities. The natural landscape and scenery in the country is beautiful and could easily be developed into an eco-tourism destination. Source: Lao National Tourism Administration. Tourism is worth looking into and the government of Lao is aware of this. Official statistics from the National Tourism Administration in Vientiane shows that millions of tourists come to Lao every year and that there was – at least for several years – sharp increases in the number of arrivals from 2009 to 2015. Based on available statistics, Lao saw the highest number of tourist arrivals in the country in 2015 at 4,684,429, an increase of 12.6 percent compared to the previous year. Meanwhile, the highest increase in percentage was 25.1 percent in 2010 when the number of tourist arrivals climbed from 2,008,363 in 2009 to 2,513,028 the following year. The largest number of tourists had always come from Thailand. 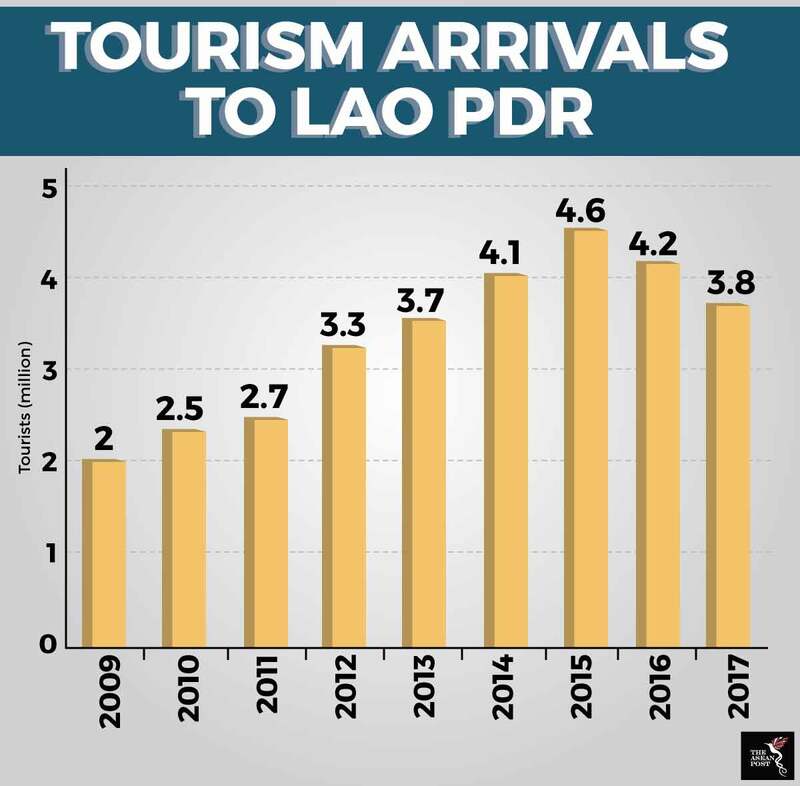 Focusing on tourism would be a logical idea except for the fact that in 2016 and 2017, Lao also saw strong decreases in the number of tourist arrivals at 10 percent and 8.7 percent, respectively. Reports in 2016 quoted an anonymous government official in Lao as providing several potential reasons for the decline. He explained that the government of Thailand had been encouraging its citizens to take tours in their own homeland by offering special promotions and incentives for local tourism. The official also brought up the fact that the cost of living in Lao has increased and could also be a contributing factor for the sudden reduction in tourist arrivals. In 2017, Tourism Research and Administrative Division Deputy Director Bounthavy Sisava said the drop in tourism was being studied and suggested that a lack of tourist attractions in some provinces, poor quality services, and substandard tourism products could be some of the reasons for the slump. To address these issues, the Laotian government launched the Visit Laos Year 2018 initiative to promote tourism and attract more visitors to the country. The initiative highlights activities and local festivals spread across various provinces. A possible consideration for the Lao government could lie in balancing its resources better. While the government seems to understand this and has placed some emphasis on growing its tourism sector, the scale of resources and focus given to hydropower seems to be rather overwhelming. While hydropower could give that much needed boost to the country’s coffers and in turn help improve the tourism sector; Lao’s current goals for hydropower may be a little too optimistic. However, Lao prime minister Thongloun Sisoulith recently told the World Economic Forum on ASEAN in Hanoi, Vietnam that Lao will continue to persevere with its hydropower strategy. The plus side is that his country has vowed to intensify scrutiny on lucrative mega projects to ensure viability and to prevent more disasters from occurring. There are an estimated 51 existing hydroelectric projects already in operations in Lao, and the Xe-Pian Xe-Namnoy dam is one of 46 more under construction. Another 112 projects are at the development stage.